If the first part of the Kunsthistorisches Museum’s Kunstkammer seems impressive, the second part takes it up to another level. Gallery 27 holds items from the Prague collection of Emperor Rudolf II. He had no head for politics – his brother eventually had to step in as Rudolf stumbled from one political disaster to the next. However, Rudolf did have a good head for art and science, encouraging both and building a quite astonishing collection of rare items, many of which we can now see in the Kunstkammer. Elsewhere in the room you’ll find mechanical clocks from the late 1500s and early 1600s, sundials (if you forget to wind up the clocks), vessels made of precious stone (believed to have healing or restorative powers), and much more. 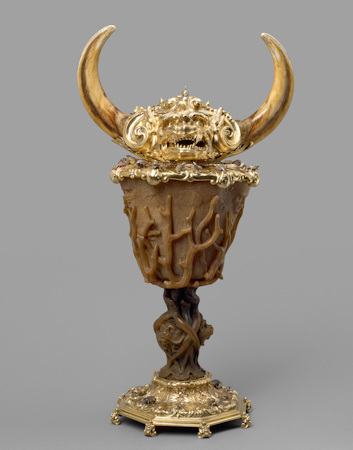 Everything’s a highlight, really, but don’t miss the narwhal goblet from 1600/1605 – made of narwhal ivory, gold, enamel, diamonds, rubies, agate and ivory. Or the extraordinary detail on the gilded silver and enamel ornamental ewer and basin from 1601/1602. I was pleased the ewer and basin carries the designation “ornamental”, because the idea of someone using it for actual holding food would be the extreme of decadence (so probably quite plausible when it comes to European royals). Be sure to view the bronze figure of a Flying Mercury by Giambologna from 1585. The Roman god stands on the toes of one foot…a weighty challenge when sculpting in metal. Compare the piece with the German Mercury figure in the neighbouring cabinet – there’s no competition. After the last gallery you may be feeling both drained and exhilarated by the variety and quality of the collection. But take a deep breath and move on to Gallery 26. This covers the stonecutting arts, with, for example, 17th century landscapes and cityscapes built mosaic-like from precious agate, jasper and hornstone. There’s also a small private altar from 1590/1600 featuring Christ and the Woman of Samaria, and made of a who’s who of precious gems: rock crystal, jasper, agates, lapis lazuli, emeralds, amethyst, gold, enamel, gilded silver and pearls. 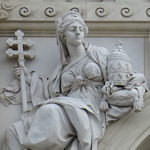 Having an extended family ruling large chunks of Europe had many advantages. One was access to the exotic items brought back by seafaring explorers. The Habsburgs on the Iberian peninsular had the best pickings of course, which often found their way to the rest of the family as gifts. Better than socks at any rate. Gallery 25 houses some of these items. The rarity of such things as rhino horns and ostrich eggs – often attributed medicinal and magical powers by those whose local eggs were only of the chicken variety – is reflected in their sumptuous settings. These artistic settings often served to emphasise the exotic nature of each piece, for example through a figure of an African below an ostrich shell. Other highlights here include a giant 1592 basin and ewer decorated with pearl and garnets. Look round its edges for metal casts of frogs and insects. There’s also a large bezoar on a gold, emerald and ruby base from the late 1500s. Bezoars are indigestible masses found in the gastrointestinal system of animals. In the 1500s, they believed putting one in a drink got rid of the poison. I’m guessing that didn’t work out too well. The next gallery (24) features items from the 16th century Innsbruck collection of Archduke Ferdinand II. I enjoyed the so-called hand stones, pieces of ore with biblical or mining scenes carved into them, with added decorative elements and models. The side room here features a lot of glassware and crystalware from Milanese workshops (e.g. Saracchi and Miseroni). It also continues the theme of intertwining nature and art. Many pieces are representations of the human body, plants, animals and shells, often mixed with natural materials and given surprising practical functions: a tortoise becomes a powder flask, a nautilus shell becomes a drinking vessel. As you pass into Gallery 22 and the 17th century, you might notice a change of focus. The earlier collections may have played a representative role, but you also get a clear feeling that the items were valued for their novelty, rarity or artistry. They seem to reflect a genuine awe of man and nature’s capabilities and a stronger motivation than just a game of royal “my art is better than your art”. Now it seems a bit more about self-representation: impressing visitors and demonstrating legitimacy and righteousness through the medium of art, often through models, bronzes and similar of the collectors themselves. It adds a cynical note to the joys of what you see. Of course, there are still many delightful items to admire, particularly the gorgeous ivory statuettes by an unknown artist known only as the Master of the Furies. Which is the name I’m going to use next time I order pizza. Have a peek at the ivory phoenix from 1610/1620. The rough plumage turns your perception of ivory carvings upside down – no milky sheen or smooth lines. Delightful and irritating in equal measure. The later rooms are the beginning of the end for the Kunstkammer, literally and figuratively. Paintings now began to take over as the “art of choice” for well-financed royals. Which is not to say that these galleries are not worth seeing. In Gallery 23 (to the side of Gallery 22), for example, you’ll find 17th century clocks and scientific instruments from the collection of Archduke Leopold Wilhelm. His nephew, Emperor Leopold I, was a big fan of ivory, as you can tell in Gallery 20. Again, we’re now firmly embedded in a world of art pandering to the self-glorification of the Habsburgs. This concept is perfectly illustrated by the impressive ivory piece from 1700 depicting Leopold adorned with angels, with a foot resting on his vanquished Ottoman foes following the famous defeats of the Ottoman armies, most notably at Vienna in 1683. Leopold was, of course, nowhere to be seen at the Siege of Vienna, having fled well before the first scimitar was pointed at the Vienna city walls. But I’m sure he was there in spirit. I loved the detailed ivory and cedar reliefs by Ignaz Elhafen from the late 1600s and early 1700s (see the battle of Amazons, for example, with its mind-blowing detail) and the ivory reliefs by Johann Ignaz Bendl, who also contributed to the famous plague column in Vienna’s centre. The last gallery in the Kunstkammer is 19, itself designed to impress visiting dignitaries with its ceiling painting by Julius Victor Berger. You’re pretty much done. And if a few hundred years of art, politics, history, science and coconuts haven’t tired you out, it’s time to move on to the Kunsthistorisches Museum’sother collections.